ON THE way to Delhi via National Highway-1, the Bhalswa dumping site can be seen from as far as 5 km. In the 22 years of its existence, the landfill, which is the size of four international sports stadiums, has become almost 15-storeys high. “We spend our time controlling fire from the gas that this mountain of waste releases. And when it rains, the mountain slides,” says a senior engineer at the Municipal Corporation of Delhi (MCD), requesting not to be named. “Nobody wants to handle this department.” Delhi generates close to 4,000 truckloads of waste every day. All its three landfills, including Bhalswa, were exhausted seven years ago but the city has nowhere else to dump its waste. MCD has gone to court demanding 250 ha from the Delhi Development Authority for new landfill sites. Almost every city in India is seeing rifts among land authorities, local bodies and communities over solid waste management. As the country’s economy is growing, it is consuming more, thus, generating more waste. India produced 127 million kg of municipal solid waste per day in 2011-12, as per official estimate. This is 12 times of what Delhi generates. Actual amount could be much more. The World Bank estimates that solid waste generation in India will rise by 243 per cent from 2012 to 2025. After years of mismanagement, the government is now revising rules and manual to deal with the growing solid waste and incorporate the large army of ragpickers and waste dealers in the formal system. The Ministry of Environment and Forests (MoEF) formulated the Municipal Solid Waste (Management & Handling) Rules, or MSW Rules, in 2000. Simultaneously, the Ministry of Urban Development (MoUD) prepared a manual to facilitate the interpretation and implementation of the rules. But the rules barely got implemented. After 14 years, MoEF is now revising the MSW Rules, 2000. An expert committee, including officials from MoUD and Deutsche Gesellschaftfür Internationale Zusammenarbeit, an infrastructure and environment firm, has drafted a manual for the revised rules. In July this year, MoUD held a workshop in Delhi to finalise the draft manual. Some 250 professionals from the environment and urban development ministries, Central Pollution Control Board (CPCB), urban local bodies and private players from across India were present to deliberate on the draft. It provides detailed guidelines for formulating a waste management plan and defines institutional responsibilities and financial requirements. But fails to provide a practical approach to integrate ragpickers in the formal sector, allocate space for community bins and landfills and address waste management in rural India, among other lacunae. To better utilise the services of ragpickers and waste dealers, the manual proposes providing them legal identity and protective gear like boots and gloves. 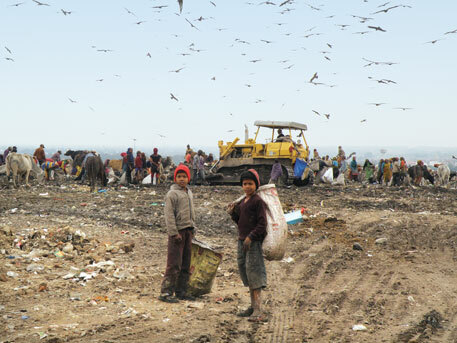 The ragpickers can be seen in action on top of the Bhalswa landfill. As soon as a truck unloads garbage, they jump into the heap and start segregating. Within minutes, all that is left is unsaleable waste. “We bleed every day and catch infection,” says 12-year-old Bittoo. “On lucky days I make Rs 300, but sometimes I make nothing. We get beaten up for climbing this hill of waste, but practically we do their [municipality’s] job,” he speaks quickly as he focuses on his work. Protective gear is not sufficient. “It is time the government provided some space to the ragpickers for the job they do. They cannot operate in somebody’s backyard or adjacent to a drain forever,” says Rakesh Solanki, president of the Delhi-based Environmental Science Research Foundation (ESRF). According to CPCB, 70 per cent of the total solid waste in the country is collected and only 12 per cent is treated. Segregation at source, collection, storage, treatment and scientific disposal of waste are insufficient. Considering the problem of waste storage, the manual proposes replacement of neighbourhood storage depots with metal containers to maintain hygiene. But it does not say where they should be placed. “It is better if some spatial requirements are provided in the manual. Their placement should not lead to traffic congestion or unhygienic conditions,” says Srinivas, senior town planner in MoUD. The manual is also silent on a strategy to reduce environmental degradation caused by existing landfills. These sites have been polluting underground water for decades and are highly inflammable. India incurs huge economic losses on account of environmental costs, and more than 20 public health diseases are caused by poor waste management, notes Shanker Aggarwal, secretary, MoUD. Improve technical expertise The manual lays down stage-wise responsibilities for urban local bodies, such as preparing detailed project reports and using advanced information technology tools like geographic and management information systems. These would be irrelevant if the technical expertise of the urban local bodies is not enhanced. The manual also proposes public-private partnership (PPP) for waste management projects. Representatives at the workshop pointed out that PPP projects related to MSW Rules did not run throughout the concession period in the past due to technical, financial and legal constraints. They noted that instead of suggesting new PPP projects, the draft should learn from the past. Srinivas believes that urban local bodies need to have the right exposure to implement PPP projects. “Every detail cannot be incorporated in the manual,” says an expert committee member from MoUD. The manual makes no mention of waste management in either rural India or the 3,892 towns without urban local bodies, thus excluding about 70 per cent of the country. It is the definition of the municipal authority that determines the areas that will be covered by the manual. The draft rules, which are supposed to provide the definition, are yet to be notified. Rural areas consume biodegradable waste more efficiently than urban areas but plastic and electronic waste have emerged as major problems in rural areas, says Solanki. It is not clear whether the government will draft a separate manual for rural waste. A few kinds of special waste that find mention in the manual include plastic waste, biomedical waste and waste from slaughterhouses. They need special handling and disposal for the safety of human health and environment. However, in India, such waste usually gets mixed with municipal solid waste. The manual fails to recognise other kinds of special waste like “seasonal waste”. This gets generated during a particular season like Diwali, when the quantum of waste doubles, or during religious festivals like Kumbh Mela in Allahabad, when 30 million people arrive in the city and produce waste beyond the stipulated quantity. Others include hazardous waste such as mercury thermometers and compact fluorescent lamps, horticultural waste and pharmaceutical waste. These wastes finally find their way to the landfills. The manual does not recommend appropriate ways of disposal for all these wastes, nor does it suggest how to increase the awareness of the workers handling special wastes mixed with solid waste. Guidelines for using recyclable packaging material are also missing. Packaging today is done by metallised layers of aluminium, tin and plastic, which are quite impossible to process. 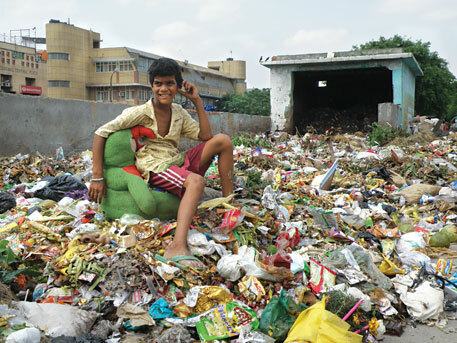 The state of waste management in India today can be best described as deplorable. The draft manual on municipal solid waste management prepared by the government overlooks the practical problems of the sector. India needs a manual that can be implemented, not one that adds to the existing pile. I hope they put some laws on transportation of municipal waste in place too. The current practice of transport of municipal waste often during peak hours not only disrupts traffic but also is highly undesirable. Moreover, in absence of spatial laws of protecting garbage bins/vats, they tend to become focus of shops that need a disposal site close-by, especially meat/fish vendors causing filth and on a larger perspective encroachment exacerbating issues relating to vehicular and pedestrian circulation. This is quite thought provoking, esp. the facts and figures are mind boggling. I honestly hadn't given this topic much consideration but now I feel its one of the most ignored issues in the country. I hope this will bring about a change, if not in the physical world, then at least in the mindsets of people to start giving waste management a thought! Management of waste involves a complex set of potential impacts on human health and safety, and the environment. The impacts have been long ignored. Every aspect like handling, storage, collection and transportation, sorting, processing and disposal is important and must be given due consideration. 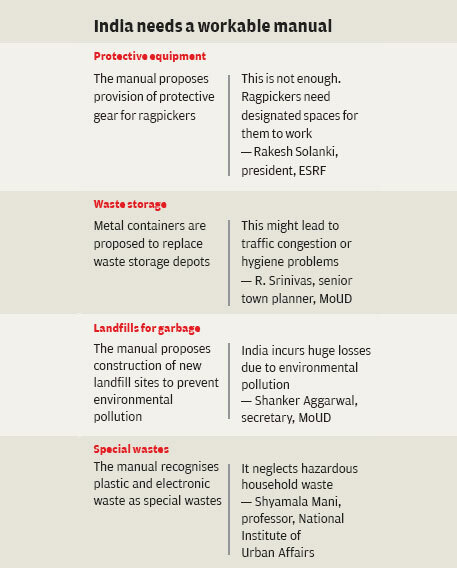 European Union’s solution for waste problem needs to be adopted in India.